Unknown Holcombe was the child of Martin Allen Holcombe and Philancia Patchin. Candace C. Holcombe was born on 29 June 1866 at MI.1 She was the daughter of Martin Allen Holcombe and Philancia Patchin. Candace C. Holcombe married George H. Tucker after 1878. William K. Morgan married Emily C. Holcombe, daughter of Martin Allen Holcombe and Philancia Patchin. George H. Tucker married Candace C. Holcombe, daughter of Martin Allen Holcombe and Philancia Patchin, after 1878. Sarah McArthur was born at OH. She married Harvey Holcombe, son of Calvin Holcombe and Eunice Reed. William B. Holcombe was born on 4 October 1828 at OH. He was the son of Harvey Holcombe and Sarah McArthur. 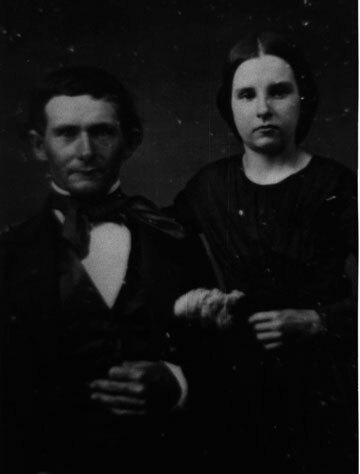 William B. Holcombe married Harriet Oviate in February 1855. William is recorded in the 1860 census of Paris, Portage Co., OH as married and living in his parents' home there; moved to Newton Falls, OH, where his father, Harvery was living in his family in 1890. [S25] Hannah McPherson, Holcombe Genealogy, Page 118.2/Item A-8-1-1-13-3-3-1. Dwight M. Holcombe was born at OH. He was the son of Harvey Holcombe and Sarah McArthur. Dwight M. Holcombe married Ella Maria Thompson, daughter of Gaylord Thompson and Elsie Voorhes, on 21 October 1874. Dwight M. and Ella M. were enumerated in the 1920 Medina, Medina Co., OH, federal census, ED 76, page 18A. He was 67, born in OH; she was also 67 and born in OH. [S25] Hannah McPherson, Holcombe Genealogy, Page 118.2/Item A-8-1-1-13-3-3-2. Grant Holcombe was the son of Harvey Holcombe and Sarah McArthur. Grant Holcombe lived at Warren, Trumbull Co., OH. Recorded in the 1860 census as a seamstress. Eunice C. Holcombe was born on 15 July 1836 at OH. She was the daughter of Harvey Holcombe and Sarah McArthur. Harriet Oviate was born on 22 October 1835. She married William B. Holcombe, son of Harvey Holcombe and Sarah McArthur, in February 1855. John W. Holcombe was the son of William B. Holcombe and Harriet Oviate. Laura Holcombe was the daughter of William B. Holcombe and Harriet Oviate. Ella Maria Thompson was born on 30 March 1852 at MI. She was the daughter of Gaylord Thompson and Elsie Voorhes. Ella Maria Thompson married Dwight M. Holcombe, son of Harvey Holcombe and Sarah McArthur, on 21 October 1874. Gaylord Thompson was the son of Archibald Thompson and Jacoba Schumann. Raymond Holcombe was born in August 1875. He was the son of Dwight M. Holcombe and Ella Maria Thompson. Henry Holcombe was born on 30 March 1881. He was the son of Dwight M. Holcombe and Ella Maria Thompson. Wilbert W. Holcombe was the son of Watson Holcombe. Martin E. Holcombe was the son of Watson Holcombe. Helen Mars Holcombe was born on 2 April 1849. She was the daughter of Chester Reuben Holcombe and Julia Ann Patterson. [S25] Hannah McPherson, Holcombe Genealogy, Page 118.2/Item A-8-1-1-13-3-6-1. Wallace Chester Holcombe was born on 4 August 1853 at OH.2 He was the son of Chester Reuben Holcombe and Julia Ann Patterson. Wallace C. and Hattie were enumerated in the 1920 Paris, Portage Co., OH, federal census. He was a farmer age 66, she ws 65. There were no children in the household. [S25] Hannah McPherson, Holcombe Genealogy, Page 118.2/Item A-8-1-1-13-3-6-2. James Warren Holcombe was born on 14 February 1857 at OH.2 He was the son of Chester Reuben Holcombe and Julia Ann Patterson. James Warren Holcombe was graduated in 1881 at Cornell University, Ithica, NY. He was ELECTION in 1886 at Mayor, Ravenna, Portage Co., OH. He married Katherine Merts on 2 March 1892. Jams and Katherine were enumerated in the 1900 Cleveland, Cuyhoga Co., OH, federal census. He was an attorney, age 43; she was 44. Children in the household were Lida M. 5, and Mary K. 3. [S25] Hannah McPherson, Holcombe Genealogy, Page 118.2/Item A-8-1-1-13-3-6-3. Katherine Merts was born in July 1859 at OH.1 She married James Warren Holcombe, son of Chester Reuben Holcombe and Julia Ann Patterson, on 2 March 1892. Katherine Merts died on 26 March 1933 at Alcazar Hotel, Cleveland, Cuyahoga Co., OH, at age 73. She was buried at Ravenna, Portage Co., OH. Lida M. Holcombe was born in July 1894 at OH.1 She was the daughter of James Warren Holcombe and Katherine Merts. Mary Katherine Holcombe was born in August 1896 at OH.1 She was the daughter of James Warren Holcombe and Katherine Merts. Charles Holcombe lived at Newton Falls, Trumbull Co., OH. He was born at Branford, New Haven Co., CT. He was the son of Martin Dennis Holcombe. Frank E. Holcombe was born in January 1868 at Branford, New Haven Co., CT. He was the son of Martin Dennis Holcombe. Frank E. Holcombe died on 31 December 1932 at Akron, Summit Co., OH, at age 64. Frank graduated from Yale Business College; served as manager of NY City office of B.F. Goodrich Co., general manager, Kelley-Springfield Tire Co.
Thee is an E. Frank Holcomb, age 3, in the 1870 federal census of Branford in the household of John and S. Emily Holcomb. Frank E. Holcombe, who was general manager of the Kelly Springfield Tire Company factory for twenty-one years until it ws moved from here, died yesterday from a heart ailment, after an attack of influenza. He was born in Granford, Conn., sixty-five years ago and was graduated from the Yale Business College. After leaving the tier concern, he became manager of an Akron foundry andlater was with a silica concern. At one time he ws manager of an office of the B. F. Goodrich Company in New York. He belonged to the Masonic Order and the Akron Rotary Club. Surviving are a widow, the former Miss Grace Wilford of Branford, a son, Wilford Holcomb, Akron business man, and a daughter, Miss Esther Holcomb, instruction in a girls' school at Brewster, Mass. [S25] Hannah McPherson, Holcombe Genealogy, Page 119.1/Item A--1-1-13-3-7-2. Frederick Phelps was born circa 1733. He was the son of Joseph Phelps and Susannah Eno. David Crawley Chappell was the son of William Chappell and Elizabeth Dickey. Sarah Chappell was born on 18 March 1786 at Halifax Co., VA. She was the daughter of William Chappell and Elizabeth Dickey. Sarah Chappell died in 1859 at "Missing Place" no. 5902. [S350] Phil E. Chappell, Chappell Revised, Page 243. John Watkins Chappell was born at Halifax Co., VA. He was the son of William Chappell and Elizabeth Dickey. Alexander Chappell was born at Halifax Co., VA. He was the son of William Chappell and Elizabeth Dickey. In 1880 William B. was the census taker in Wayne Co. He and his wife were enumerated in District 3 on pages 1 and 15. He was a farmer age 52, she was 32. Children in the household were William W. 21, Anna O. 19, Finley 9, Charles P. 7, Summers 6, Julia B. 3, and Ashley, 9 months. However, on page 1 his 32 year old wife was listed as Mary Z. and on page 15 she was listed as Mollie. Alexander Chappell was born on 23 January 1834.1 He was the son of William Chappell Junior and Sarah L. Palmer. Wilford Holcombe was born in April 1896 at CT. He was the son of Frank E. Holcombe and Grace Wilford. Wilford Holcombe married Priscilla (?) circa 1920. Wilford Holcombe lived at Akron, Summit Co., OH. [S25] Hannah McPherson, Holcombe Genealogy, Page 119.1/Item A-8-1-1-13-3-7-2-1. [S25] Hannah McPherson, Holcombe Genealogy, Page 119.1/Item A-8-1-1-13-5-1. [S161] Carol A. Laun, Granby Center Cemetery, Page 140. Edmund A. Holcombe was born in 1806. He was the son of Bethuel Holcombe and Clarissa Fuller. Edmund A. Holcombe married Mabel Wells, daughter of Samuel Welles and Anna Griswold, on 13 June 1833. Edmund A. Holcombe died on 26 February 1873.2 He was buried at Center Cemetery, Granby, Hartford Co., CT.
Edmund, Mable, and Ann were enumerated in the 1850 Granby CT federal census, page 1, line 17. He was a farmer with real estate valued at $3,600. He was 44, she was 46. the only child in the household was Ann age 12. There were two other children Delbert Aldrich 16, and Marshall Gaines 11, laborers. Edmund, Mable, and Ann were enumerated in the 1860 Granby, Hartford Co., CT, census. Elizabeth Holcombe, age 73, lives with them. Edmund, Mable, and Ann were enumerated in the 1870 Granby, Hartford Co., CT, census. He was a farmer. [S25] Hannah McPherson, Holcombe Genealogy, Page 119.1/Item A-8-1-1-13-5-2. [S161] Carol A. Laun, Granby Center Cemetery, Page 114. [S161] Carol A. Laun, Granby Center Cemetery, Page 128.